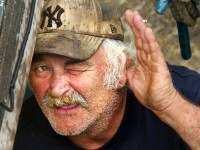 John Pilkinmgton, 74, of North Berwick, whose nickname is âpuffin,â tries to hear his grandchildren talk before sailing out for prawn fishing at the North Berwick harbor in Scotland, on August 4, 2011. Pilkinmgton, who has two great grand children and five grand children, has been prawn fishing all his life. He goes out prawn fishing every afternoon with his two grandsons and spends the whole night on the sea fishing.